Please read the Igloo Shopping Cart Instructions Here. 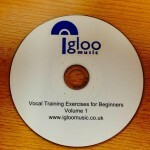 Vocal exercises for beginners is designed to help you improve the quality of your voice. Technical and physical exercise is what makes you better at singing, and what makes your voice sound better. This suite of mp3s comprises a 30 minute workout that you can use to develop vocal strength and stamina, and to extend your range. Use one or two tracks as a warm up, and half or all the tracks for a vocal workout. These vocal exercises for beginners are user-friendly and give step by step instructions. Contact us if you would like this on CD. Do two of these tracks every day for a week, and you will notice a difference. If you would like this on CD please contact us.